Ideas become more difficult to summarize in proportion to how much one knows about them. 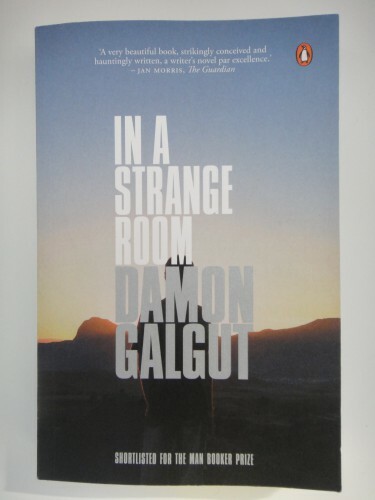 And as I read more of Damon Galgut, he becomes harder to summarize. This is a compliment, possibly more so than my assertion that his books are good. In A Strange Room lives in a very different space to The Good Doctor or The Imposter even if it is tied to them by a common soul. It was nominated for the Booker Prize if that matters to you. Read on if it doesn’t. In a Strange Room you must empty yourself for sleep. And before you are emptied for sleep, what are you? A traveller, perhaps. In three stories, in three places, in three journeys, the protagonist travels. Through Southern Africa, Northern Africa, India, he meets different people in different places at different times in his life. Sometimes this protagonist is our narrator Damon, and sometimes Damon is watching his old self as his actions and motivations become opaque in the distance of memory. In a Strange Room is a book about travel, but it’s not the journey outside that’s of interest. It’s the journey inside, the journey discover the self and others from the viewpoint of someone who’s aware of how much he does not belong. Maybe In a Strange Room is Damon’s quest to find a home or companionship. Often Damon himself isn’t clear on what he’s looking for, but the book is minimalist, open enough allow many interpretations of its text and subtext. So as the title may suggest, it’s a strange book, and describing it this way feels as though I haven’t described it at all. In a Strange Room may be about the process of reconstructing memory and, in that sense, the haziness of distant events is executed excellently. The narration swaps seamlessly between “I” and “he”, explores eminently how difficult it is to unravel memories, even of ourselves. And the three stories themselves are emotional and human. There’s something liberating in stripping down to the minimum and travelling through strange lands, but tragedy comes through in the imperfections of human relationships. Like in The Good Doctor, the relationships are grounded in stark unapologetic realism. At times, In a Strange Room is heart-breaking, and at times it’s an emotional train wreck. And it lacks closure. But closure isn’t what In a Strange Room is about. It’s about loneliness and isolation, about the strangeness of life and human tragedy. It may take some time to appreciate the style but it’s an honest book, and moving even if I didn’t always understand why. It’s difficult to say exactly what nature of enjoyment or engagement I derived from the book but there were times when I was absorbed completely and times when I was turning page after page. If I can say nothing else useful about the book then let me say it’s well-written.